For time immemorial, goblins have been mercilessly hunted down and killed by the so-called “civilized” humans, slaughtered in droves for the entertainment of bloodthirsty adventurers. But everyone has their limits, even the underdogs. The pathetic goblins who eke out a living near the human lands are weak and timid, the aggression bred out of them through generations of culling, with only the most cowardly among them managing to survive. But the feral goblins of the western tribes are another matter entirely, as the rapidly encroaching scourge of human civilization is about to discover. On the border between the goblin and human lands, the goblins are scattered and disorganized, and mostly consist of small families huddled together in caves. Bands of humans frequently attack these underground warrens, stealing whatever they can carry and leaving a pile of corpses in their wake. In their ignorance, the humans have come to assume that these tame and sniveling goblins are representative of the entire race. Driven by their insatiable greed and bloodlust, the humans have pushed ever deeper into goblin territory, and the tribes have finally taken notice. Back in December 2015 I decided to try my hand at writing a One Sheet, which I then expanded into a full setting. I've discussed it extensively on both my blog and the old forums, but as it's still a work in progress I thought it would be a good idea to post updates here as well. 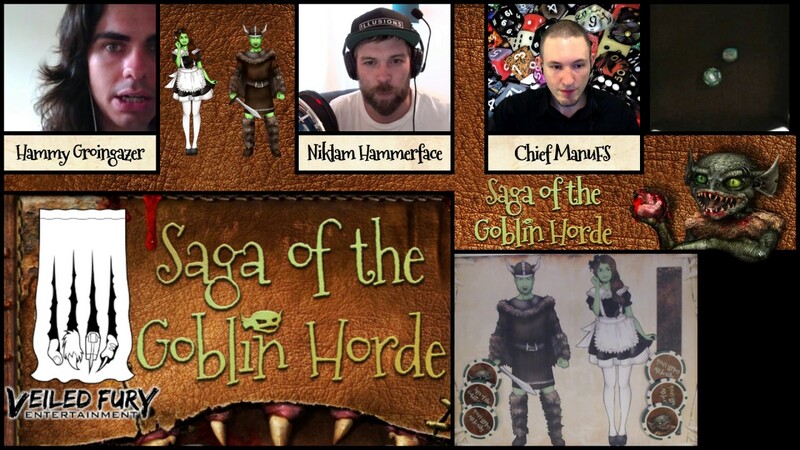 Saga of the Goblin Horde is a campaign setting which focuses on a relatively small geographical area, and follows the great war between humans and goblins, with everything described from the goblin perspective. The players take on the role of vicious goblinoid gang bosses from the Redfang tribe, leading the war effort against the relentless tide of humanity. The setting is dark fantasy with black humor, and while the characters' antics can be somewhat comical at times, these are not the bumblingly incompetent goblins you might envision from other settings; the gang bosses are ruthless and deadly. Included here are the PDFs available for download, I will update this list as more content is released. Setting Book: The complete setting, including the Plot Point Campaign. Player’s Guide: The player's half of the setting book. Goblin Princess: 1 bonus archetype. The Treetop Twits: 2 bonus archetypes. Fast-Track Gang Bosses: 17 fan-made archetypes by Jason Baryla, built with the Mutation Deck. An Axe to Grind: Christmas themed One Sheet. Back to the Roots: One Sheet Adventure. Bone of Contention: One Sheet Adventure. Can of Wyrms: Sequel to Egg Hunt. Cold Spell: One Sheet Adventure. Egg Hunt: Easter themed One Sheet. Hot Water: One Sheet Adventure. Jumping the Bearsharktopus: One Sheet Adventure. Root of the Problem: One Sheet Adventure. Samhain Surprise: Halloween themed One Sheet. Sanguine Solstice: Christmas themed One Sheet. Season’s Beatings: Christmas themed One Sheet. Sleigh Heist: Christmas themed One Sheet. Worm Food: One Sheet Adventure. The Big Brawl: Fan-made One Sheet by David Garrett. Blood Rapids Run: Fan-made One Sheet by Jason Baryla. Adventure Cards: 8 bonus cards to add to your Adventure Deck. Configurable Map: Uses layers to show travel routes for the adventures. Countdown Deck: Thematic Action Deck for Saga of the Goblin Horde. Printable Tokens: Bennies you can print and cut out. VTT Cards and Tokens: Action Deck and Bennies for Virtual Tabletops. Well of the Ancients: Map for the Hot Water One Sheet. Silent Street, Trick or Treat: Map for the Samhain Surprise One Sheet. Meet and Greet, Swift Retreat: Map for the Samhain Surprise One Sheet. Druid Meat, Foes to Beat: Map for the Samhain Surprise One Sheet. Battle Map: The Cavern: Map for the Dungeon Squat Plot Point Episode. The Wild Die Podcast: Interview and discussion about the setting. The Wild Die Podcast: 6 Heads for the Head Honcho Actual Play. The Savage German: Dungeon Squat and Tavern Crawl Actual Play. Veiled Fury Entertainment: Worm Food Actual Play. Grim Review: Saga of the Goblin Horde: Review of the setting book. Mr. Mean Speaks: Review of the Countdown Deck. Veiled Fury Entertainment: Review of the Countdown Decks. Official Page: Where I post updates and promotions. Public Group: For discussions about the setting. Last edited by Zadmar; 04-22-2019, 06:24 PM. I've also created custom Wild Dice and custom Bennies, and discussed the process on my blog. They've come all the way from Hightree Ridge, enticed by the promise of fame, glory, and as many humans as they can eat. Meet Hammy Groingazer and Niklam Hammerface, the brutal borderland brothers, known among the tribes as the Treetop Twits! Worm Food: An appropriately hard mission for a couple of inappropriately hard goblins. I won't repeat the Saga of the Goblin Horde updates I made on the old forums, but there's was one major update I couldn't post because the forums were down. Back in June, Manuel Sambs of Veiled Fury Entertainment ran a Savage Worlds Actual Play starring Harrison Hunt and Nikk Lambley from the TableTop Twats Podcast. It was hilarious, and well worth watching! You can download the adventure Manuel ran here, and the two characters that Harrison and Nikk played here. Last edited by Zadmar; 08-18-2017, 10:11 AM. For those who are interested, I've just updated the Saga of the Goblin Horde Player's Guide for Savage Worlds, adding the two new setting rules. You can read more about the update here. Zadmar, I did have a question. In one of your blogs you were talking about the plot point and the war clock mechanic. I cannot seem to find any more on that mechanic, I would love to hear some more about it. The episodes in a Plot Point Campaign are often designed to be triggered at specific times, such as when the heroes first visit a particular location, or when they reach a certain rank, etc. The War Clock is designed to do the same sort of thing. The first two Plot Point Episodes (Dungeon Squat and Tavern Crawl) are supposed to be run back-to-back as an introduction to the setting. After those, the GM can insert some adventures of their own, running the third and fourth Plot Point Episodes when they feel it's time to progress with the main story. But after the fourth Plot Point Episode (Kick Off) the humans declare war on the goblins, and from that point on the GM is supposed to use the War Clock to track the escalation. The last six Plot Point Episodes each represent major attacks from the humans. Imagine a clock face with symbols for the last six Plot Point Episodes marked around the outside, at 2, 4, 6, 8, 10 and 12 o'clock. Each time the players complete a regular adventure (such as a One Sheet) the GM ticks a number of boxes around the outside of the clock, depending on certain criteria, such as whether the goblins were spotted in the human lands by witnesses, whether they destroyed property, killed soldiers or civilians, etc. When the War Clock reaches a Plot Point Episode, the GM is supposed to run it for the next session. So if the characters are very stealthy and keep a low profile, the human attacks will build up fairly slowly. But if the goblins keep charging into the human lands, burning villages and slaughtering dozens of townsfolk, the human king will ramp up his offensive efforts. When the War Clock strikes midnight, the final Plot Point Episode is triggered, and it'll be time to pull out the Mass Battle rules. If the characters did well in the earlier adventures, they should have support from most (if not all) of the other tribes, and they'll need it! In the comments section of your blog post about the PPC, you replied that you anticipate having the campaign book ready this fall prior to the poster's intended campaign start of October/November. Do you still anticipate that timeline being accurate, or has it changed in the intervening 3 months? Yes, I'm expecting to release it next month, probably mid-to-late September. The PDF is currently 102 pages. I still need to finish writing the tenth and final Plot Point Episode (that'll add 2 more pages), and I'd like to add a few more entries to the bestiary (4-5 pages). I've written 11 adventure seeds that need to be copied over as well, and I may add a few more, but they're very short (50-100 words each) and will probably only add another 1-2 pages in total. There's also the War Clock itself, which I'll probably need to create from clipart. Once that's done I'll still need to proofread a few times, and fine-tune the layout (fortunately the layout work is mostly done already). I tested out the new "Shenanigans" setting rule last night, when I ran Bone of Contention for a couple of friends. The mechanics are pretty simple: At the beginning of each scene, each player has the option of drawing a card to see what sort of mischief their goblin gang members have been up to. The rank of the card determines a goblin's action and/or fate, while the suit indicates their motivation, and the player earns a Benny for describing and embellishing what happens. One goblin gang member shoved his boss into an open grave while they were crossing a cemetery. Later, the other boss was knocked to the ground and trampled by one of her gang members, after he saw something valuable he wanted to loot within an abbey. But it was after the party killed the abbess and her faithful hound and headed down into the crypt that things got really sordid. One player invoked the Shenanigans rule and drew the Eight of Hearts, indicating that one of her gang members had "disappeared for some private time, they will be back next scene", and that they were motivated by "lust or desire". The rest of the goblins charged down the staircase into an ancient crypt for a showdown with the necromancer they'd been hunting, attempting to defeat him before his dark ritual was complete. But the gravity of the final confrontation was completely undermined by the excited squeals echoing from the floor above. We decided not to discuss (or even contemplate) what exactly the goblin was doing. Glad to hear that the setting / campaign guide is coming soon! I was rereading the Players Guide yesterday and found the Shenanigans setting rule interesting. The one thing that bothered me though was that there didn't seem to be any good/positive results and that many (most?) of the results boiled down to losing a member of the boss' gang for the next scene. The descriptions varied nicely, but the results didn't seem to vary as much. The original concept behind Shenanigans might be best summarized as "A gang member gets themselves nominated for a Darwin Award, and the player earns a Benny as compensation". So really, it gives players another way to earn Bennies. The cards are drawn to give the player inspiration for the goblin's fate (a little bit like Interludes), and I did include a few alternative outcomes (including a positive outcome on Joker), but overall they're supposed to be negative. If the outcomes were an equal mixture of positive and negative, I'd have to take away the Benny reward, or limit the rule in some other way, otherwise it would become a no-brainer and get overused to the point of being annoying. Zadmar, I agree that Shenanigans should be mostly (if not all) negative outcomes since the rule is basically a twist on Hindrances, but I think that point can be made a bit more clearly. If the main text of the rule mentions that the gang member is either killed, wanders off, or otherwise loses suffers a penalty (the severity of which can be determined by card value), then the descriptors can be trimmed down significantly and prevented from sounding "too much alike." There are three "automatically killed" results and two "unconscious" results, but the other nine results are all different. The descriptions are already pretty short, too, so I'm not sure removing the mechanics would make them much shorter (and even if it did, I'd have to add the same amount of text elsewhere in the column anyway, to make the page layout look good). I could make sure that every result is unique though. I wasn't originally going to include an adventure generator, but I recently changed my mind. With 10 plot point episodes and 16 adventure seeds, combined with the 9 One Sheets I've already released and the 2 other One Sheets written by SotGH fans, the adventure generator isn't essential, but I think it will still come in useful. The adventure generator uses a different die for each table, so you can roll all the dice at once and then look up the results afterwards. It allows you to create adventures with the same five-scene structure as my One Sheets, with each scene based around a different game mechanic.